Katowice shares a lot of similarities with Ostrava; the town has mostly developed in last 180 years after industrialization; it used to be the most important mining town in the post war Poland. Over the years it became a cultural centre as the capital of the Silesian region. 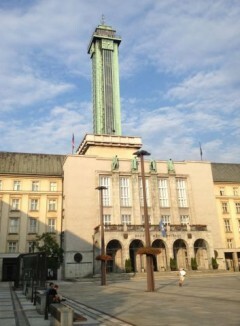 We arrived in Katowice station on Sunday afternoon. Our hotel was the highest building in town and the view from 27th floor stretches for miles. I couldn’t decide if I preferred the look of Katowice from above or below. 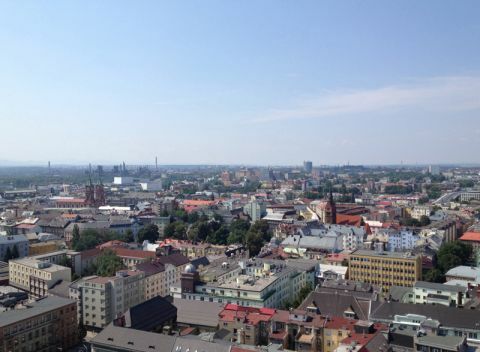 The city landscape with monumental mining shafts erected almost in the city centre with high tower blocks from each side of the town left from communist area of the town are overwhelming when viewed from the top of the tower hotel. When you are in the centre itself there are many opportunities to appreciate the dynamic town of Katowice. The central part of town formed in 19th century and in the present day is a mixture of 19th century eclectic buildings, examples of Art Nouveau mixed with modernist architecture and communist “giants” such as Spodek (concert hall) and Superjednostka (15 floors block of flats almost 2km in length, housing up to 30,000 people). The Rynek – main square (which is not square at all) is under reconstruction at the moment. The streets are dug up and some of the traffic is stopped. During our stay the trams were still going through the partly blocked square, but it was obvious they will be redirected soon too. From the square there are some nice streets with cafes and restaurants such as Starowiejska or Mariacka street with neogothic Mariacki church at the end of the street. Mariacka street is a popular night destination for students who are a large part of population of Katowice in term time. The main train station has been under reconstruction for last 2 years. The new design of Katowice Station created lots of controversy and protests from architects and local activists. 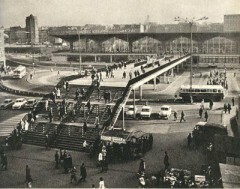 The original station was built 1972 and it was the best example of the Brutalist form of Modernism in Poland. 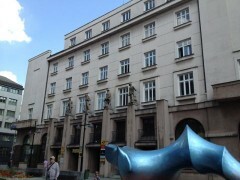 The building was designed by Wacław Kłyszewski, Jerzy Mokrzyński and Eugeniusz Wierzbicki. Using reinforced concrete they constructed 16 pillars of parabolic hyperbola shape popularly called “goblets” (kielichy); making a sculptural form that created the main station hall of 76 314 cubical meters. 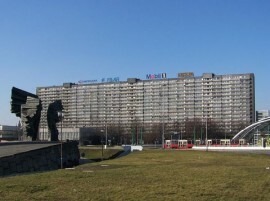 The station alongside Spodek became an iconic symbol of Katowice and its architecture. Unfortunately over the years the building became neglected and in 2008 there was a discussion about whether to renovate or rebuild the station. The Spanish Neinver firm won the design competition to rebuild the station, with a plan for an integrated shopping centre on the side of the station. To start with a decision was made to keep the original “goblets” form of the building but the developer using an excuse that the pillars were unsafe proposed the demolition of the vital part of the station (the developer wanted to build a road under the pillars to a new underground car park). Unfortunately despite the protests and efforts to list the building, the original pillars were pulled down, the last one fall in January 2011.The developer rebuilt all 16 pillars in the new structure. In my opinion it is a real shame that original pillars had to go and that the main form of the station is now going to be covered by new shopping centre. I’m sad that I didn’t get a chance to record in the large hall of this iconic building. It made me think of projects that try to preserve the acoustics of the places, which will disappear with the time. Unfortunately I was too late. 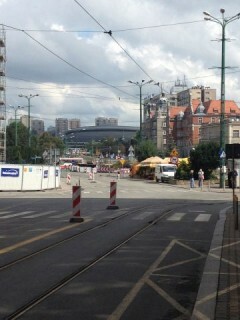 I have decided to try to capture the sound of Katowice just as they are now with the sounds of a giant building site. It is interesting how much investment is going into this post-industrial city. There is a positive note in these sounds of construction sites; they give the city a feeling of growth and vibrancy, which is at once alarming with its jangling and crashing but also reassuring; sounding a positive note for the future growth and development of the city. As the first orientation point we visited the Nove Radnice (new town hall) – largest town hall complex in Czech Republic, it was build in 1925-1930 and it is one of many examples of modernist architecture in town. In the central part of this monumental building is a 85m high viewing tower. The green copper tower gives you a great view of this postindustrial city. Nove Radnice have a clock on top of the tower with a bell which stride every quarter and an hour, which of course I have recorded between 11 and 12 of following day. The other interesting example of modernism architecture from 1920s is Art House – town gallery on Jureckova street. This time it’s only two-story very simple and functional building. My attention was also captured by near by Palace Electra originally a base for miners’ union, also built in 1924. Palace Electra placed on the two corners of three streets has equally important façade from three sides of the building. The town is surrounded by vast residential areas from 1950s such as the District of Poruba (a manifestation of the so-called socialist realism in architecture) consisting of 1960s and 70s housing blocks which grew with the modernization of the city in under communism. I was very surprised how quiet the town was during the weekend. On Saturday late morning we visited the main square in Old town with Baroque Stare Radnice (old town hall). 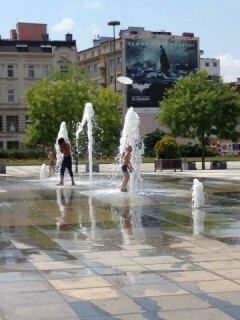 The square was almost empty; there were only few people passing by and a handful of kids playing in the water fountain. I have made some recordings of screaming kids running in and out of the water. Stare Radnice clock played interesting an interesting tune on an hour which I also managed to capture. The Stare Radnice has been home to the Museum of Ostrava since 1931, but unfortunately it closes by 1pm on Saturdays, so by the time I finished recording, the museum was closed for the day. I sat down in museum café sneakily recording a snippets of conversation between an American researcher and an old miner. The conversation was through a translator, so there were Czech and English sentences passing my microphones. Later on, when I realized, that I need a new set of AA batteries for my recorder I have discovered that all the shops in the old town are closed by 1 pm. After a conversation with a local man he directed me to new build large modern shopping mall were we found the rest of Ostrava’s population. On Sunday morning I made my way to the Ostrava train station; a very interesting piece of 60s architecture. The station is constructed in such a way that it connects all city transport together; a large crescent canopy integral to the main station building which shelters the waiting commuters from rain or snow on tram, electric bus or taxi stops. This spot made a fantastic location to record sounds of all of this forms of transport. The reverb of inside of a large1960s station with frequent announcements made a very successful recording for the project. The rail connects Ostrava with Brno, Vienna, Bratislava, Katowice, Warsaw and even Moscow. After few months of editing my previously collected material I am back on my journey recording four new locations to complete the 12 hours sound clock of “Krakow to Venice” project. The first location to visit after the break is Ostrava in Moravian-Silesian part of the Czech Republic it is a city only 50 km from Polish border. We arrive in the third largest city of the Czech Republic on Friday afternoon which gave me enough time to have a quick look around the city centre for recording sites for the 11-12 am hour. 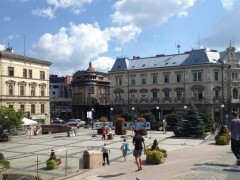 Although the population of Ostrava is over 300 000, the town centre was very quite during our two day stay. Ostrava covers over 214 km2 and is divided to several districts. On the site of the old city centre is the industrial Vitkovice – district established in 1828 after the discovery of large layers of black coal. With the birth of industrial Vitkovice , the city developed rapidly, several coalmines and steel works were built. The steel works originally belonged to Viennese Salomon Mayer von Rothschild with direct connection to Vienna by Kaiseer-Ferdinands Nordbahn in 1847 which gave Ostrava the industrial boost. After the World War II the steel works were privatised as VZKG by the Czechoslovak state as was the the rest of the industry in Eastern Europe. Unfortunately Ostrava remains the most polluted city in EU with the highest concentration of PM10 dust. In Vitcovice there is a museum of mining but unfortunately we ran out of time to see it on this visit.